Check out this easy Cheese Tortellini Soup Recipe! If you ar looking for a new Slow Cooker Recipe for your Crockpot, be sure to check out this Cheese Tortellini Soup Recipe! This is a great party recipe or easy dinner recipe for your family! We made this for our family and had a soup party one night. It was a hit! I love crockpot meals because I can start them in the morning or around lunch and they are ready by dinner time! It helps to simplify my life and save money because we aren’t eating out as much! Plus, be sure to check out even more Easy Dinner Recipes! Serve Warm. Top with additional Parmesan Cheese and Croutons. This is a great soup recipe to share with friends and family! I hope you enjoy it as much as we do! Plus, be sure to check out these Freezer Meals for your Crockpot! Freezer Cooking has become one of the things that saves me the most time and money in my life right now. It is so nice having meals that are ready to eat in my freezer to pull out on a day when I won’t be home to cook dinner! Check out these Freezer Meal Recipes for Printable Shopping Lists, Assembly Videos, and more! 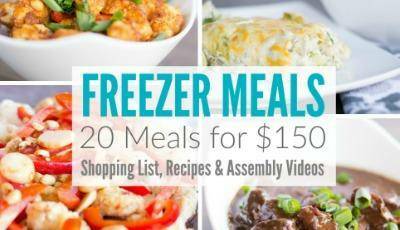 20 Freezer Meal Plan for Under $150! Chocolate Peanut Butter Cupcakes Recipe!